Suekoto : Chu-jyo saku ranking : Mino province. Blade length : 69.8 cm or 27.48 inches. Sori : 2.0 cm or 0.78 inches. Width at the Kissaki : 1.8 cm or 0.7 inches. Era : Late Muromachi period Meiou era. 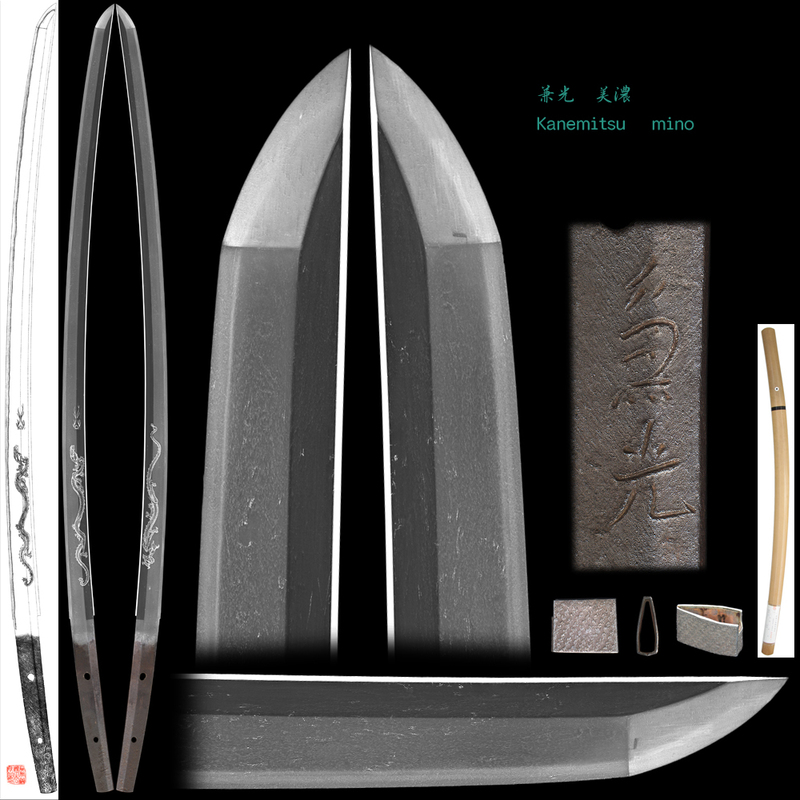 Shape : The blade is suriage and Machiokuri nakago with signature is mentioned middle part of the nakago. 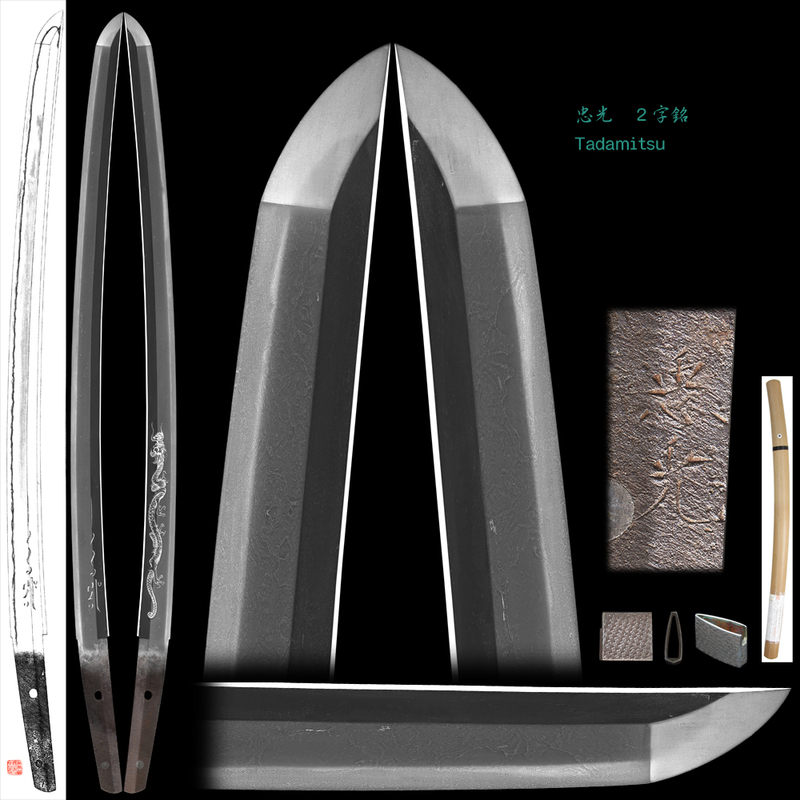 The blade is rather wide and thick healthy blade with Hairyu is engraved both sides of the blade. Jitetsu : Koitame hada and komokume hada muchi with jinie attach beautiful texture. Hamon : Niedeki suguha with koashi scatter. Special feature : This Kanemitsu belonged to Seki province. Even though the blade is suriage, the blade is healthy nice looking shape. Horimono(Hairyu) on both sides are well done. Generally speaking sueseki jigane is not good reputation but meio era to Eisho era, the blade is very good work compare with late muromachi period. It is very attractive Jigane and hamon. Tsuba :On the round shaped silver plate, engraved a dragon and clouds. Fuchikashira : A dragon and clouds are engraved by silver plate. Saya : On the black roiro saya, mountain range are engraved by makie and kirimon by gold color. Menuki : A dragon is engraved by silver plate. Kogai : A dragon is engraved by silver plate. Kozuka : A dragon is engraved by silver plate. Blade length : 50.7 cm or 19.96 inches. Width at the hamachi : 2.66 cm or 1.04 inches. Era :Late Muromachi period Bunmei era. 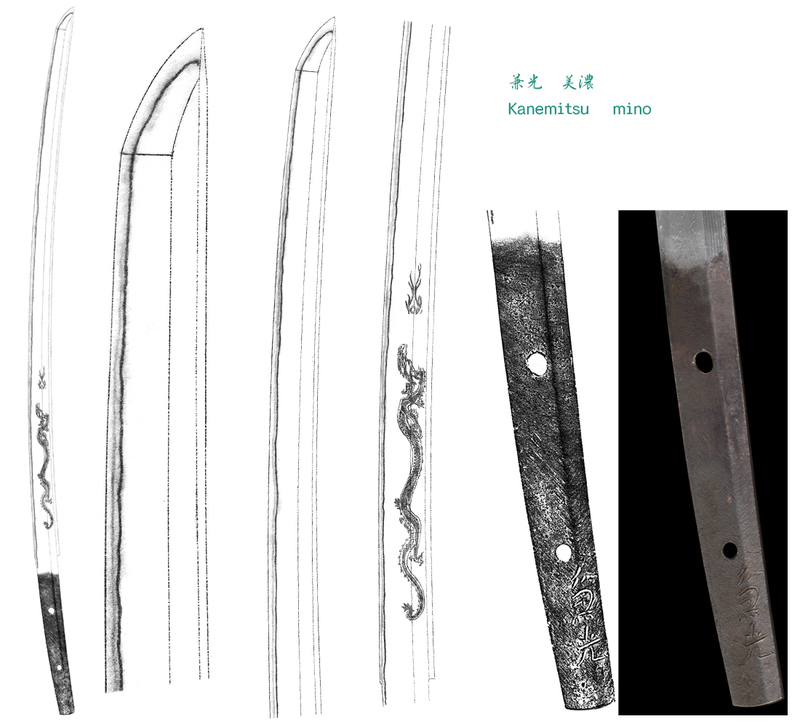 Shape : The blade is rather wide and thick with sori and on the front, a dragon is engraved. Jitetsu : Komokume hada well grained with jinie attach. Hamon :konie deki suguha with koashi work. 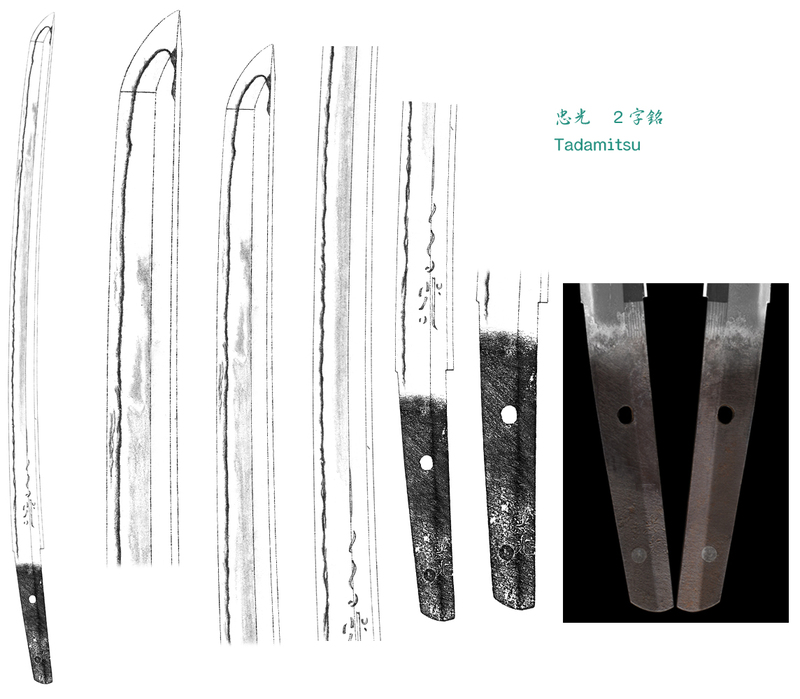 Special feature : The signature is 2 characters Tadamitsu but the blade is not mass productive item,I think the blade was made around Bunmei era. Tsuba : On the round shaped silver plate, engraved a dragon and clouds. NBTHK Hozon Paper : Dai Sho. NBTHK Tokubetsu Kicho Paper : Koshirae. Price (credit card) : JPY 3,500,000-. Katana : Teisitu Gigei in Gassan Sadakazu 78 years made by politely.